It’s been over two years since I posted here and I just wanted to assure you, dear reader, that I’m still alive. You can see some more frequent signs of life on my Twitter feed. Mostly I complain about computers, though the majority of my life is taken up by medical school these days. To avoid this being an entirely content free post, I will discuss something I’ve got a lot of experience with but never wrote about: Bluetooth headsets. I listen to podcasts almost exclusively through Bluetooth headsets, and have for about the past three years. I wear a headset for probably an average of an hour a day, sometimes more like three or four on the weekends when I’m cooking, cleaning and doing laundry. My right ear is stretched compared with my left ear as a result. I almost never talk on the phone with my headsets, so if you’re looking for a comparison of call quality, look somewhere else. I have, over the years, owned 6 mono headsets and 4 stereo headsets, not counting the Plantronics headset I got for my father. While most are so bad they don’t bear mentioning, my favorites have been the Jawbone ICON and ERA. I bought the ICON in June 2010; it worked perfectly reliably until I accidentally washed it in September 2011. Newly clean, the LED still came on to indicate the battery was charging, but it never showed as fully charged and wouldn’t power on any more—I don’t blame it! I bought an ERA shortly thereafter, which worked fine until about a week ago when the volume started spontaneously dropping. I think this is simply a loose connection to the speaker as I can often restore the volume by changing the headset’s position. The headset took quite a lot of abuse including several drops so, again, I don’t really blame its design or manufacture. Earlier this week, instead of getting another ERA (left), I bought a BlueAnt Q3 (right), which I haven’t decided to send back yet. I thought about making a comparison table, but then I realized how much I hate comparison tables, so here are some bulleted lists instead. A2DP support. Without this, it’d be pretty useless for listening to podcasts. The power switch is a slider (the extent of my hatred for the Apple aluminum Bluetooth keyboard power button is not printable in this forum). The status LED is on the inside of the headset, and is a ring of moderate brightness rather than a pinpoint of extreme brightness. Jawbone includes a wonderful shape-holding micro USB cable for recharging. For a while, it was infuriating to try to connect the device to the cable by feel given the odd angle at which it sits, but I eventually realized that the curve on the cable more or less matches the curve on the inside of the headset, and all was well. 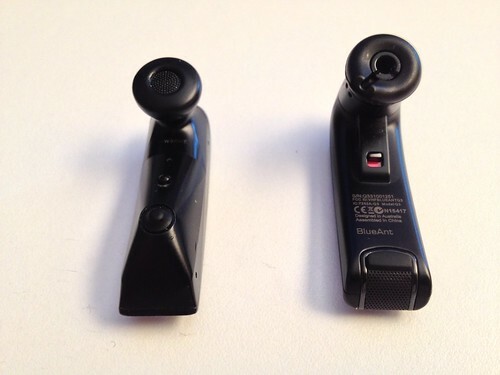 The headset only has one button, whose function is relatively easy to determine: one tap either performs call control functions (if the phone is ringing/off hook) or speaks the approximate remaining talk time. Holding it triggers Siri, if nothing is playing, or cycles the volume if something is. Mac software lets me do things including renaming the headset, upgrading firmware, configuring the button behavior, and installing experimental features like (originally) A2DP support. You can monitor battery life from the iPhone display. The device shows essentially no wear after heavy use for years, aside from the JAWBONE text rubbing off slightly. Charging status is easy to see: red pulsing ring for charging, white for charged. There’s no audible feedback for the first few seconds when turning on the headset. Startup is slow — total time from power on to pairing with an iPhone 4S is about 5 seconds. About once a month, the headset would power on, far away from any computer or USB port, and decide that it was waiting for a software update. The headset would feel the need to remind me of this mantra (“Please wait while new software is being installed. Your headset will restart when it’s done.”) every few seconds for a minute. This would play over the top of any audio. There was no way that I could find to abort this process and, you know, use the headset immediately. Volume control requires you to hold down the button while audio is playing (otherwise, it triggers Siri, the way I have it configured), and inevitably causes me to overcorrect and/or trigger Siri. It’s hard to figure out whether the volume is increasing or decreasing, as it alternates after it “bounces” off the extrema. Related to the above: triggering Siri requires holding down the button, hearing 2 beeps from the headset, then waiting a while before hearing Siri’s acknowledgement. You’re supposed to be able to trigger various actions by tapping or shaking the headset. These never worked reliably for me. I have to carry around two earbuds: one is comfortable to wear for hours when listening to audio, but it puts the headset so far away from my mouth that the phone call quality — or, more relevantly for me, Siri — is essentially unusable. The other earbud I use for phone calls, very infrequently. There’s also an ear hook, but it does not attach securely and has been awkward to the point of uselessness in my experience. Sometimes A2DP would drop until I power cycled the headset, though the phone would think it’s playing. This may very well be Apple’s bug, as iOS Bluetooth has certainly had its share. The BlueAnt Q3 shares quite a few of the Jawbone headsets’ features (A2DP, iPhone-visible battery life, power slider) and will hopefully be an adequate replacement. Startup and connection is substantially faster: under three seconds versus 5 for the ERA. Audible feedback on startup is a battery report (unfortunately just as a level like “high”), rather than a chime, and is essentially immediate. A2DP is supported when two devices are connected simultaneously. The Jawbone ERA will connect to two devices at once, but only the first-connected device streams audio to the headset. The Q3 announces “There are two phones connected” when the second device connects. While fewer earbuds are supplied, and none are designed to sit inside your ear canal (unlike on the ERA), the smaller-size, simpler-design earbud fits me pretty well and — crucially — still allows me to use Siri with good accuracy. No more adding surreal shopping list items while I’m cooking! There’s an ear hook that attaches securely and works well unless I’m deliberately shaking my head (in which case the earpiece moves, but doesn’t fall off). Incoming calls play the caller’s name through the headset, rather than just the phone number. I believe synthesized names are synced from your phone via PBAP. Volume control is a 1D slider (self-centering, like a joystick) which works whether or not audio is playing. If no audio is playing, you get feedback via audio clips such as “Volume up” or “Minimum volume”. Beeps indicate the extremes of volume if audio is playing. There’s still only one button, excepting the volume control, and absolutely nothing requires you to hold it down.¹ You either tap once and say one of a small set of voice commands to the headset (report on both headset and iPhone battery life, pairing, redial, etc. ), or tap twice to trigger Siri. There are more thorough and well-designed voice prompts; for example, on an incoming call, there’s help on what buttons to push to answer or ignore it, carefully timed so it doesn’t bother you if you know what to do. Audio pairing help is extensive, unobtrusive and well-done. It’s possible to trigger a connection attempt from the headset (tap the button and say “Am I connected?”), a wonderful thing if you’re using iOS with its obnoxious refusal to provide fast access to Bluetooth settings. There’s an annoying click at the end of each voice prompt audio clip, perhaps when the speaker is getting power cycled. This should really be eliminated. I get a loud noise in my ear, probably from compression of the earbud, when I try to push the button if I don’t hold the headset still with my hand. The button offers too much resistance to pressure, feels flimsier, and is oriented vertically rather than horizontally. There is no Mac software or ability to rename the headset (“BlueAnt Q3 V1.35”), though a firmware upgrade tool is coming. Obnoxious flashing LED is obnoxious — bright, and on the outside. At least I don’t have to see it. The grille (decorative?) is already getting things stuck to it after an hour — bad design. It comes with an ordinary micro-USB cable, and the headset is difficult to connect to it by feel. It’s possible to use the Jawbone cable, but you don’t end up with a very secure fit. The range and interference robustness are substantially worse — not usually an issue when I have the phone in my pocket. I should quantify this at some point. I can’t discern any difference audio quality-wise, but keep in mind I listen to spoken word content. The BlueAnt headset does seem to get louder. I really wish iOS permitted control of non-iTunes audio via Siri. Play/pause would be enough! I guess we’ll find out in a few weeks if anything will change in iOS 7. Some comparative photos I took are here. For further information, I find iLounge’s reviews to be consistently accurate (Q3 and ERA). There is an iPhone 5-specific issue — related to wideband audio, and looking like Apple’s fault — with the Q3, which is discussed in the review and acknowledged on BlueAnt’s Web site. There’s now a special version of firmware 1.41 to work around the issue. As discussed above, a Mac updater is not yet available (it’s promised for a few months hence) but the Windows updater worked fine in VMware Fusion. ¹Actually, a few features do require holding the button and/or volume slider, but I would never use them daily as I would with Siri on the Jawbone ERA. One swaps the behavior of volume up/down so it makes sense in your left ear, some others handle call waiting/conferencing, and one resets the headset.